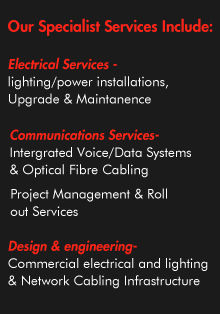 Established in 1972, R W Palmer Electrical Service has been servicing commercial enterprises for over 33 years. In July of 2005, Bob Palmer [the founder of R W Palmer Electrical Service] retired from the business passing the management and controlling interest to Shane Merlino. Shane's pro­active management philosophy and trade experience complements the tradition of services provided to our clients throughout those years by our dedicated team. Shane brings to the company his own list of accomplishments within the Electrical & Communications trade, having started out in 1991, he succeeded to hold the positions of Technician, Supervisor, Senior Project Manager, Design & Quotation, Bid Management, and now, Managing Director - leading a exceptional team, some with more than 40 years experience in their trade. Our vision for the business is to further develop relationships with our clients by continuing to deliver quality service through the team at R W Palmer Electrical Service by ensuring appropriate training and alliances with industry partners. We have a commitment to be “THE BEST AT ALL WE DO” by continuing professional development of staff and exceeding our client's expectations in delivery of service.